It is soup weather here in Maine, and what is a better accompaniment than cornbread? Honey Cornbread muffins in fact. Served hot with butter and honey! These are delicious, not too sweet and moist. This recipe makes 18 delicious muffins. I find that my kids tend to grab them for a snack much easier than cutting a slice of cornbread. Not too sweet, perfectly moist, made as individual muffins, a delicious side and easy to grab snack. In a bowl, combine corn meal, flour, sugar, baking powder and salt. In a separate bowl, whisk together milk, eggs, melted butter, vanilla and honey until well blended.Combine wet and dry ingredients and stir until just blended. Pour batter into greased or lined muffin pan. Bake 13-17 minutes or until golden brown. 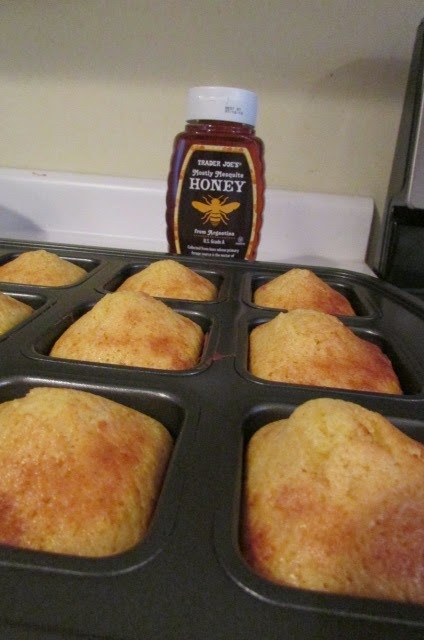 I love cornbread muffins and I bet the addition of honey makes yours so yummy! YUMMY! Pinned this for later! Thank you Nancy, love them with soups or stews, or in a bowl with milk for breakfast! This sounds like a fantastic recipe and I love the idea of adding honey in there! YUM!